A lot has happened since the last SUMP! update. The most major change has been going back to the idea of VOTE SUMP! instead of SUPPORT SUMP! 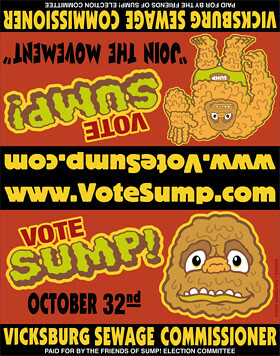 I went back to VOTE SUMP! because it was determined people could actually place their vote on the votesump.com web site. Where as before you really couldn't vote for SUMP at all. That would have been anti-climatic. Foldover yard sign designs are done (shown above). I found a local supplier of "U" shaped metal stakes perfect for signs like this. The web site is designed. It only needs to be coded and have the domain name secured. RED 7 Studios (my employer) will be handling the site details. When I told them what I was planning they offered to fully support whatever I wanted to do. This included use of their large format printer and numerous other supplies free of charge. Very Kuhl. 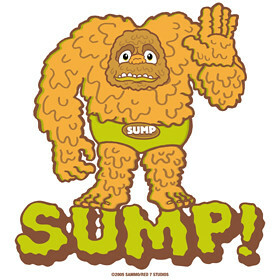 The SUMP online video game will probably be a reality. I only need to illustrate the background and assorted elements. RED 7 Studios will also be doing the game coding. (Like I mentioned they're very supportive). I'm nearly complete uploading images to the cafepress.com store. I've posted a bumper sticker and a shirt design above. All in all things are going smoothly. The only big catch would be if the web site can't get done. I don't think that'll be an issue though. I'm not sure when the "big rollout" will be. I'd like to shoot for the second week in October. Much depends on when the web site will be complete.